Do you want to experience an exclusive Helitour near Rome and discover its hidden wonders eat great food home mades and gathered in the woods and suuroundings ? 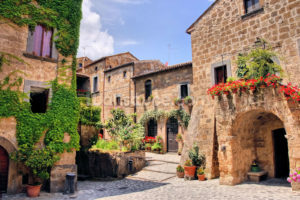 In the hills of Viterbo you can admire a small village on top of a promontory that, in days of low fog, seems almost raised compared to the ground; we are talking about Civita di Bagnoregio. 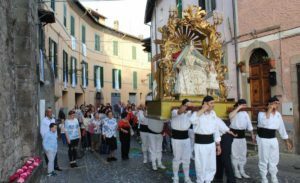 To enter the “City that dies” you have to cross a bridge that leads us to the Porta di Santa Maria, also called Porta della Cava. Once you enter the streets, both medieval and Renaissance, they take you to the central square where you can look at: the Church of San Donato, the bishop’s palace and Palazzo Alemanni, inside which we find the geological museum.The church of San Donato is an example of Renaissance architecture on a medieval structure; inside there are two works from the school of Perugino and a wooden crucifix of the school of Donatello. After that we suggest you to start a fun climb up and down between the small streets of the village having the eye always ready to get excited by the views on the valley, even if, on some days, you cannot see anything because you could be surrounded by mist and it will seem to be to you on an island in the middle of a sea of ​​fog. In a small alley there are caves where there are settlements of Etruscan times, where they worked to decrease the erosion of the hill. Obviously every time you go to an Italian village, you ask yourself: “what is the typical food I have to taste?” In Civita you cannot miss to eat picciarelli, spaghetti served with various sauces, mainly wild boar and hare, and in autum they are famous for their white truffels gathered in the woods below the city. If you have the courage and the strength to face a crowd bath you must go to Civita, to live beautiful and different experiences in which popular culture and religion are united, especially on these three occasions: Good Friday, a popular tradition of over 400 years in which more than 350 people in ancient costume evoke the passion of Jesus Christ, and the Palio della Tonna, which takes place on the first Sunday of June and the second of September, on the occasion of the liberation of the Virgin Mary and of the SS. Crucifix. You must live the rest and above all you must find out why it is called “the dying city”.